Many sufferers of OA knee pain are overweight. For these patients, containing excess soft tissue is essential for comfortable and effective bracing. That’s why our new Unloader One Plus model features a wider thigh strap than the standard version, plus a gastroc strap that helps secure the brace in place. And because bigger legs require more support, we included a sturdier upright with an Adjustable Dynamic Joint, enabling additional leverage for optimal pain management. Multiple, peer-reviewed clinical and biomechanical studies have proven the efficacy of this technology. Many sufferers of OA knee pain are overweight. For these patients, containing excess soft tissue is essential for comfortable and effective bracing. That’s why our new Unloader One Plus model features a wider thigh strap than the standard version, plus a gastroc strap that helps secure the brace in place. And because bigger legs require more support, we included a sturdier upright with an Adjustable Dynamic Joint, enabling additional leverage for optimal pain management. 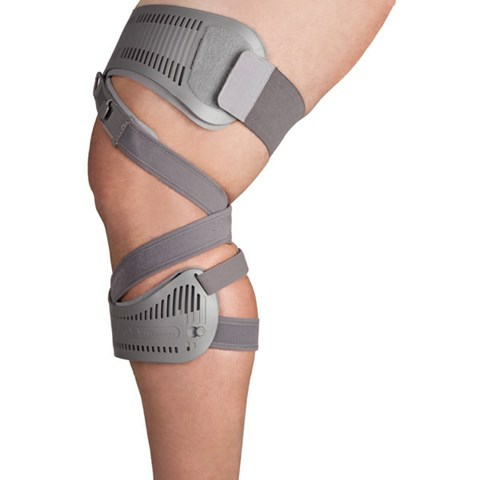 Multiple, peer-reviewed clinical and biomechanical studies have investigated the efficacy of this technology, while the brace is being worn.